2 large green tomatoes , cut into 1/2-inch-thick slices. Sprinkle the tomato slices with salt and ground black pepper and set aside. 1 tbsp flaxmeal whisked with 4 tbsp of cold water. If the mixture is still too thick and gummy , add some more water for an egg-like consistency. Place the soymilk, flour, flax mixture and cornmeal each in four separate containers, deep and wide enough to submerge the tomato slices. Heat 2 tbsp of canola or other vegetable oil in a cast-iron or non-stick skillet. Dredge each slice of tomato in the soymilk, then the flour, then the flax and finally the cornmeal, and place into the hot skillet. Fry on each side about 2 minutes over medium-high heat or until golden brown. Remove to a dish lined with paper towels to absorb any excess oil, and sprinkle with some more salt and pepper when hot, if desired. I had a little extra batter left over and I also fried up a few slices of zucchini. Yum. 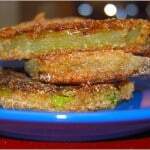 this recipe for the batter, dip the green tomatoes in it, and deep fry.